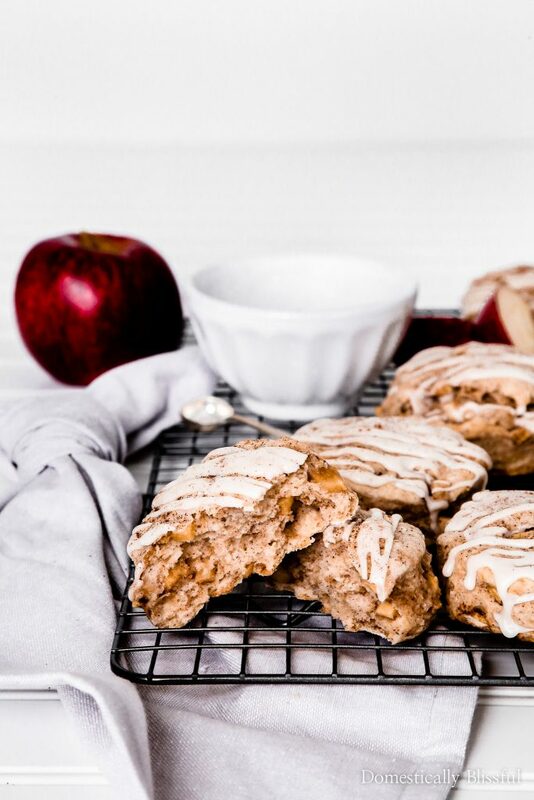 These homemade Cinnamon Apple Biscuits will fill your home with the fragrance of fall. 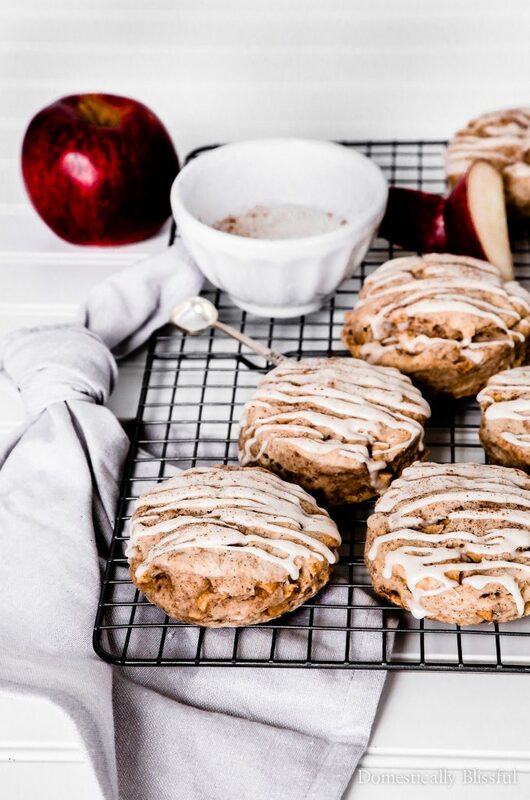 Each bite is filled with apple cinnamon pieces making them the perfect autumn recipe for breakfast, brunch, or even dessert! I know that for most people summer doesn’t end until Labor Day & that fall doesn’t technically start until the end of September, but for me personally, fall begins on the first day of August. And I wanted to have a new fall recipe ready & waiting for you on the first Monday of August. So I started enjoying fall a litter earlier this year in preparation for today’s recipe. It was so fun to get a little taste of fall baking at the end of July & I know Roger didn’t mind! 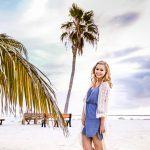 I’ve planned all sorts of delicious fall recipes planned for this year, & unfortunately, I have so many autumn recipe ideas that I will just have to wait until next year to share them all because fall is just not long enough! 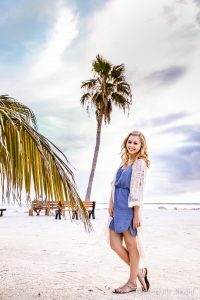 So if you want to be sure that you don’t miss out on any fun fall treats be sure to subscribe to my newsletter below. 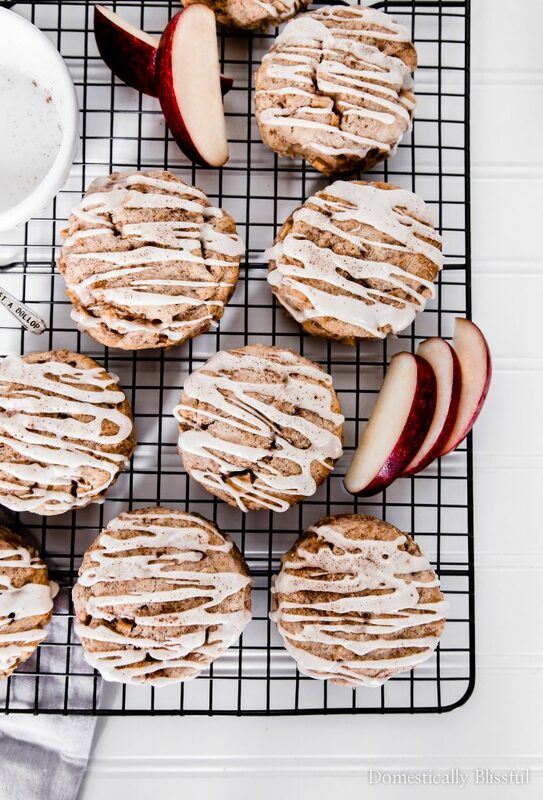 I have all sorts of sweet & savory fall recipes coming your way & they are going to be incredibly delicious! My mouth is watering just thinking about all of the fall baking that is about to take place in our home & hopefully yours too! 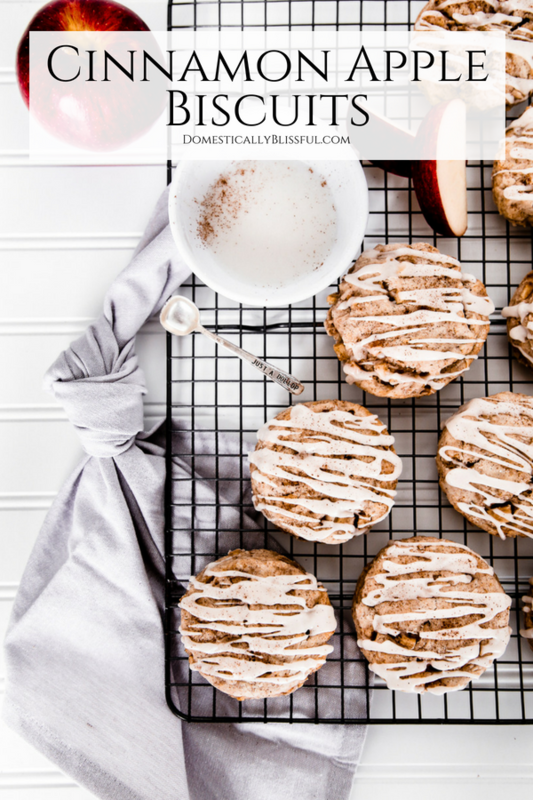 So before I run off to do some more fall baking let’s talk about these Cinnamon Apple Biscuits! 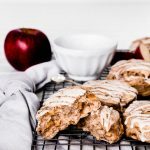 These fall biscuits are packed full of apple cinnamon flavor delivered in a soft buttermilk biscuit that melts in your mouth. My favorite part about these super easy to make & bake biscuits is the icing drizzle on top, I think it makes them taste extra special & delicious! And bonus, your home will smell amazing! First, preheat your oven to 425 degrees Fahrenheit & line a baking sheet with parchment paper (or foil with spray oil). In a medium gently mix together the diced apples, 1 teaspoon cinnamon, 2 tablespoons brown sugar, & 3 tablespoons flour. Set to the side. Place all of the dry ingredients in a food processor (*1) & give it a pulse so that the dry ingredients are evenly dispersed. Cut the butter into thin slices (about 1/3 tablespoon) & place them in the food processors with the dry ingredients. Pulse until the butter is evenly dispersed & has a crumb-like consistency. Pour the dry ingredients into a bowl, fold in the cinnamon apples, & add the buttermilk, stirring until combined. Place the dough onto a well-floured surface & use your hands to gently work the dough into a rectangular shape. With floured hands, fold the dough in half, incorporating any crumbs, & work back into a rectangular shape. Once you have the desired number of layers create a rectangular shape with your hands that is approximately 1 & 1/2 inch thick. Bake for 13-15 minutes until lightly golden brown. 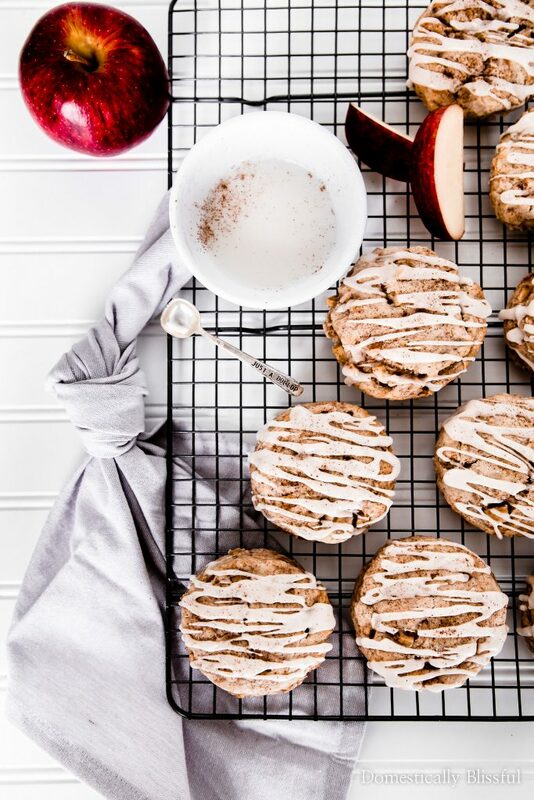 While the Cinnamon Apple Biscuits are baking whisk together the 3/4 cup powdered sugar, 1/4 teaspoon vanilla extract, & 1 tablespoon half & half. Set to the side. *1. If you don’t have a food processor you can place the ingredients in a large bowl & grate the butter into the dry ingredients. *2. The more you fold the dough the more layers you will have, just be sure you don’t overwork the dough so that it will stay light & fluffy. *3. Normally I just cut them into squares so there aren’t any scraps, but to make them pretty I used a biscuit cutter. *4. For crusty sides place the biscuits 1 inch apart. *5. Save any leftovers in a loosely sealed container. Reheat in your oven or microwave for ultimate flavor & enjoyment. What is your favorite type of biscuits? Thank you, Kay! I hope you get a chance to enjoy them this fall!